Jake Middleton-Metcalfe has recently started taking orders for his new Wolverton anglo concertinas and I was fortunate to be able to try out a couple the other day. First, a couple of disclaimers. 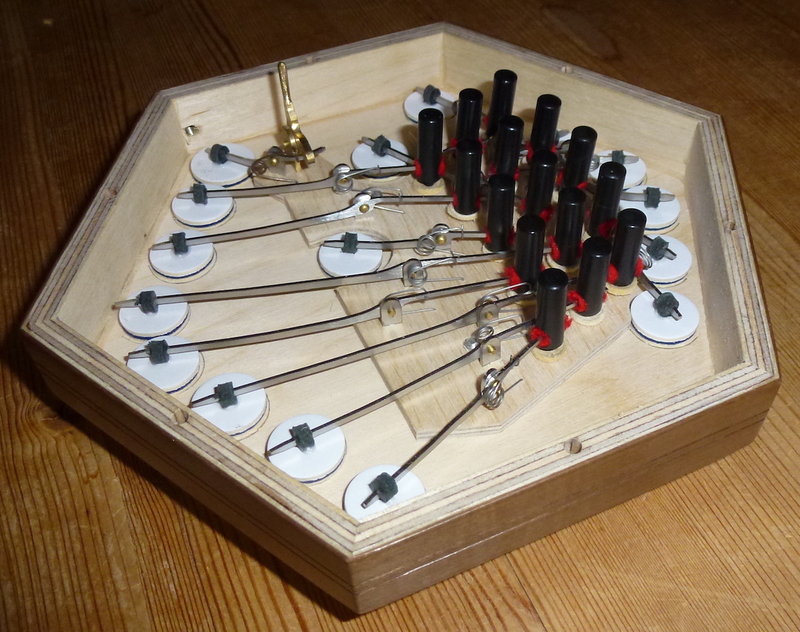 I've counted Jake as a friend for some years now and have followed with fascination his path to developing the skills necessary for building fine concertinas (they are many, but Jake has been building - as it were - on his training as a professional model maker to acquire them). So I may not be as completely unbiassed as some but I will do my best. Second, due to a stroke I had years back my left hand is not as accurate as my right, so the bass ends of these concertinas will not have had as full a workout as the right. Perhaps the most fundamental question. Well, what's the point of having a recording studio if you don't use it, so I recorded Jake playing a couple of tunes (for the technically minded, I used a pair of Neumann KM184 mics in X-Y configuration about 2 ft back from Jake, into a UAD Apollo 8 interface). We'll have a quick photo essay. Here are the two concertinas I was looking at. They are what Jake described as "production prototypes", which is to say production models will be little if at all different from these. One is a C/G anglo, the other G/D. 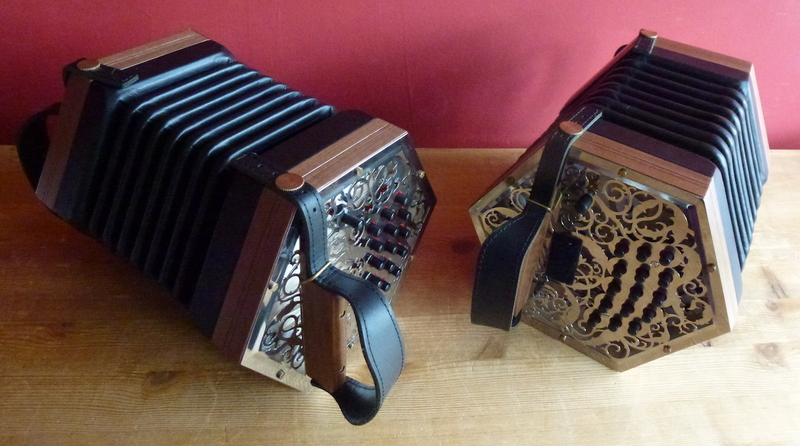 Both have 30 buttons and both use Italian accordion reeds. 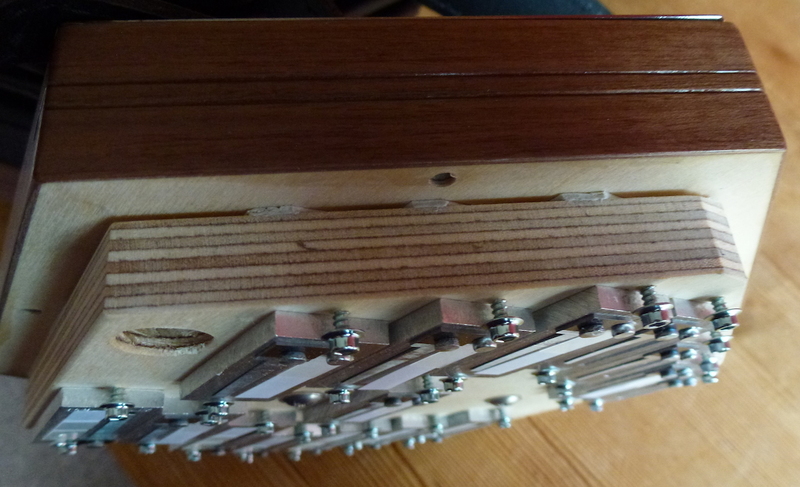 This is the end of one of the concertinas in close up showing the quality of the fretwork. 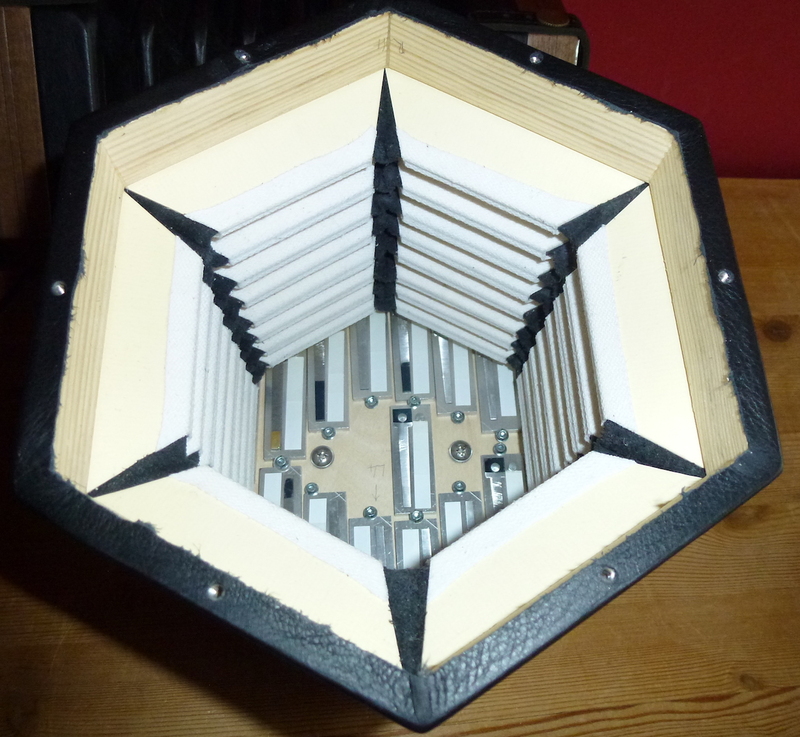 Jake told me he had deliberately designed the fretwork to allow as much sound out as possible. A close up of the bellows, very much traditional style. Neither of these have bellows papers but this is an area Jake is working on (he showed me some of the designs). 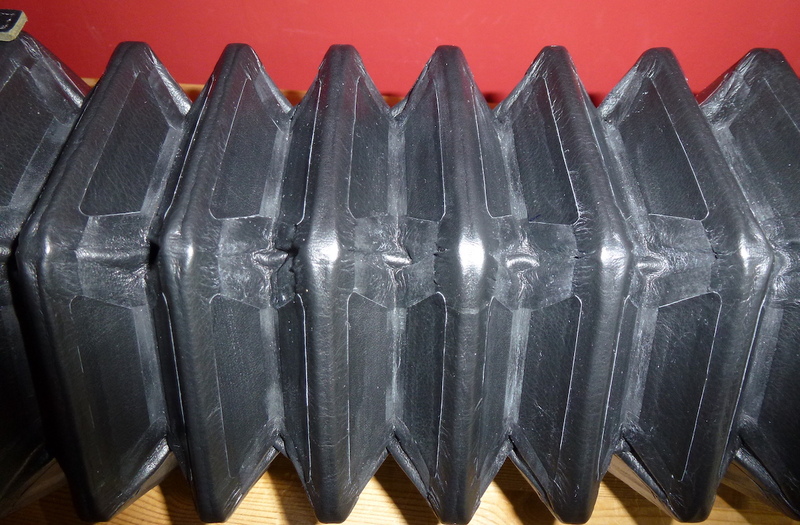 The bellows are 7-fold, somewhat unusually (all my other anglos have 6-fold bellows) but you can never have too many bellow folds on an anglo in my opinion. Here's a photo of the bellows interior, showing the neatness of construction which is typical of both these concertinas throughout. Here's the action, a nice traditional rivetted design and a neat layout which betokens some thought went into devising the layout. Finally the reed pan shown edge on, chambers are insde. I like the way the reeds are screwed in place rather than using accordion reed wax like, for instance, the Morse anglos. This should permit the owner more scope for maintenance and repair work if needed. What are they like to play? Pretty good, actually. The action is nice and fast and benefits from bushing to keep it quiet as well. It takes a bit of effort to play (especially as compared with my Jeffries 38 button but that's a bit of an unfair comparision). Much of this may be down to the new bellows which should work in with playing. For tone I compared it with my Jeffries 38 button which has a smoother but harsher and louder tone - what you'd expect from a Jeffries. My Jeffries 26 button has a wonderfully smooth and un-Jeffries-like tone which was much sweeter than any, all down to the wooden ends I'd guess. It would be interesting to hear what a wooden ended Wolverton would sound like - or perhaps leather baffles as an optional extra. The tone does reveal its accordion reeds but as you can hear from the recordings it is still very acceptable. I asked an anglo playing friend to give the left hand a bit of a work out for me, and he commented that he thought the left hand sounded a bit muddier than the right, less so on the G/D than the C/G. I think this is right but not a major issue and also quite common amongst accordion-reeded concertinas, it's the nature of the beast. My Morse G/D weighs 1030 grm and the Wolverton G/D 1368 grm, so it's significantly heavier but it has a more solid feel to it. By comparison my Jeffries 38 button G/D weighs 1462 grm. One instrument had a conventional air button, the other an air lever. This is an option on Jake's concertinas. I could get used to a lever, I guess, but note that an air lever adds a little to the work involved in dissassembling that end of the concertina. I think these are very nice concertinas and stand up well against similar concertinas from the likes of Marcus, Morse and Norman. 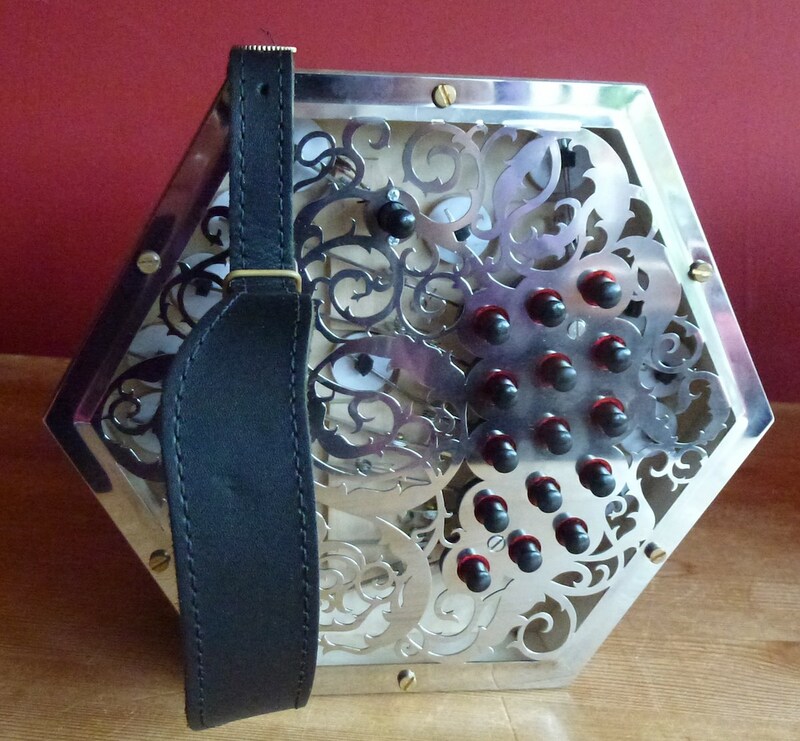 We're living in, well perhaps not a golden age of concertina making but certainly a silver one where instruments of this quality are now relatively easy to obtain. I understand that at the time of writing (June 2017) these concertinas are priced at £1500 for the basic instrument. In my estimation that makes them quite a bargain. PS1 An email from Jake says "the production models are the same but I am now offering the option of a very thin black cloth stuck behind the fretwork, makes it look a bit nicer and stops the dust and whatnot getting in".